The not-so-Midnight Cowboy: A Zola for our times? Decades ago, a distinguished cinema and television critic observed that Jon Voight, "who became famous for playing a dumb Texas stud ... is actually a university-educated, self-conscious New York intellectual". A staunch Republican, Voight is also a long-standing supporter of Israel, and like the most steadfast champions of the Jewish people he is a genuine philosemite who stands with Israel not merely out of regret for Jewish victimhood but out of admiration for what Jews have given to the world. In Israel to celebrate the 60th anniversary of its foundation, he glowingly described the Jewish State as a "moral beacon", and the following year, having seen Hamas rockets landing in Sderot, he castigated Jane Fonda and others who had signed a petition denouncing Operation Cast Lead: "Did Israel not give the Palestinians of Gaza hope that there could be peace? In response, did Hamas not launch rockets from Gaza into Israel, killing many innocent people?". You will be the first American president that lied to the Jewish people, and the American people as well, when you said that you would defend Israel, the only democratic state in the Middle East, against all their enemies. You have done just the opposite. You have propagandized Israel, until they look like they are everyone's enemy - and it has resonated throughout the world. You are putting Israel in harm's way, and you have promoted anti-Semitism throughout the world. You have brought this to a people who have given the world the Ten Commandments and most laws we live by today. The Jewish people have given the world our greatest scientists and philosophers, and the cures for many diseases, and now you play a very dangerous game so you can look like a true martyr to what you see and say are the underdogs. But the underdogs you defend are murderers and criminals who want Israel eradicated.... I pray to God you stop... With heartfelt and deep concern for America and Israel. Surely it is not hyperbolic to suggest an echo here of "J'accuse! ", Emile Zola's famous letter in L'Aurore in 1898 to France's President Faure during the Dreyfus Affair? Many learned pundits around the globe have repeatedly warned in all kinds of media about the danger that the tone and thrust of Obama's foreign policy poses for Israel. 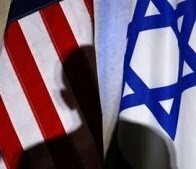 There are suspicions that Obama is currently softening his line on Israel in order not to alienate the "Israel Lobby" ahead of November's congressional election, and that once the election is out of the way his line will harden perilously. Who knows? Perhaps, given today's cult of celebrity, a letter from an ageing movie star - who is, after all, Angelina Jolie's father - will be the catalyst that crystallises public opinion in Israel's favour and sees the expected betrayal of Israel averted. If so, a latter-day Zola will be the Midnight Cowboy's finest role! Bravo Senor Aznar and the Friends of Israel Initiative! Amid the irrational and ominous hubbub of hatred for Israel that has followed the defensive raid on the flotilla vessel Mavi Marmara, a compelling voice of sanity has emerged from Spain. 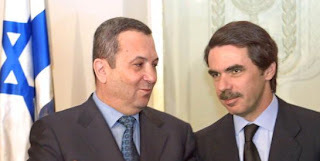 On 17 June The Times of London carried a splendid, stirring op-ed piece from Jose Maria Aznar, the tough-on-terror realist who served as Spanish prime minister from 1996-2004 (pictured with Ehud Barak in Israel in 2001). To combat the delegitimization of the State of Israel at home, abroad and inside the institutions of the international community; to publicly show our solidarity with Israel's democratic institutions - the legitimate expression of the Jewish people's milennial [sic] aspiration to live in peace and freedom in its national homeland; to support Israel's inalienable right to secure borders unmolested by terrorists or tyrannical regimes so that its citizens can continue living with the same guarantees that our own societies enjoy; to consistently and firmly oppose the prospect of a nuclear armed Iran; to work to ensure that Israel is fully accepted as a normal Western country, an essential and indivisible part of the Western world to which we belong; to reaffirm the value of the religious, moral and cultural Judeo-Christian heritage as the main source of the liberal and democratic western societies. During a recent interview, Israel's Deputy Foreign Minister, Danny Ayalon, spoke of the close relationship between his country and Australia. "We see Australia ... as ... a very good friend and ally which has historic ties here in Israel", he said. Australia can indeed boast strong links with Israel. In Palestine during the First World War an Aussie soldier, Lieutenant-Colonel Eliezer Margolin, led in succession two Jewish volunteer regiments; his ashes lie buried in Rehovot, where there is a memorial to him. Australian jurist and politician 'Doc' H. V. Evatt, President of the UN General Assembly during 1948-49, took a key part in negotiations that led to the creation of Israel. In 1965, owing to the indefatigable efforts of the well-known Jewish leader Isi Leibler, then of Melbourne and now of Jerusalem, Australia became the first country in the world to raise before the United Nations the plight of Soviet Jewry. And in 1991 Isi Leibler's brother Mark, at that time President of the Zionist Federation of Australia, played no small role in getting the UN General Assembly to rescind its shameful Resolution 3379, passed in 1975, which declared that "Zionism is a form of racism". The outstanding support for Israel of Aussie prime ministers Bob Hawke (Labor) and John Howard (Liberal) is legendary, while today Liberal Opposition leader Tony Abbott seems as staunch a friend of Israel as his immediate predecessor, Malcolm Turnbull. In May, when Kevin Rudd's Labor government expelled a Canberra-based Israeli diplomat in retaliation for the use of four Australian passports by the team wanted over the assassination in Dubai in January of a ruthless Hamas arms dealer, Abbott's deputy, Julie Bishop, who had been a minister under Howard, accused the government of over-reacting and pointed out that Israel had not been definitely implicated in the affair; she added that in any case 'It would be naive to think that Israel is the only country in the world that has used forged passports, including Australian passports, for security operations', and suggested that Australia itself had done so. Abbott, who shared her view that the expulsion was unwarranted, resisted furious demands from the government benches that she be sacked. 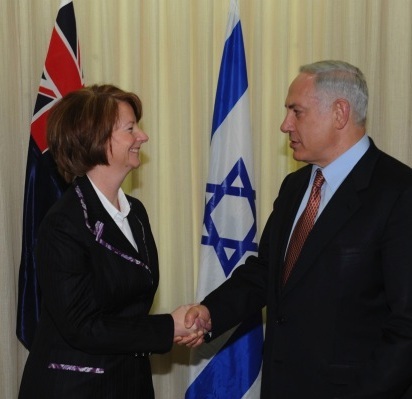 There are hopeful signs that Australia's new Labor Prime Minister, Julia Gillard (pictured with Bibi Netanyahu, whom she met in July last year when she led the Australian delegation to the inaugural Australia-Israel Leadership Forum in Jerusalem), will be a firmer friend of Israel than was the ousted Rudd. She is on record as saying that she looks forward to fostering ties between Australia and Israel at various levels: political, business, scientific, and social, and that Australia has much to learn from Israel in the high-tech field. A supporter of a two-state solution who has called on Israel to freeze West Bank settlements in pursuit of peace, she has no illusions about the terrorist nature of Hamas. During Operation Cast Lead she defended Israel's actions, a view she has since reiterated: "We made it clear ... that we understood Israel's need to defend its people .... I think we do need to remember that this was an Israeli response to continued rocket attacks out of Gaza into civilian areas. There was no pretence that the rockets coming out of Gaza were heading for strategic targets or military targets; they were aimed at civilians. And in those circumstances obviously a nation state is going to respond to the continued shelling of its people." Tie a Yellow Ribbon for Gilad! Come this Friday, 25 June, the abducted Israeli soldier Gilad Shalit, now 23, will have been held in captivity by Hamas somewhere in Gaza for four years. During that time his captors have allowed no international aid agency, including the Red Cross, access to this unfortunate young man. Blindfolded, bound, and barefoot, he appeared on a Hamas propaganda poster; a cruel animated 3D film under Hamas's auspices mocked his father's attempts to have him released, and depicted Gilad in a coffin as his distraught father looked on; Gilad appeared, looking thin, in a video which his captors made available in exchange for the release by Israel of a number of Palestinian women prisoners. There have been reports that the Free Gaza Movement, which took part in the recent "humanitarian" flotilla, refused to grant the Shalit family's request that the movement's representatives urge Hamas to allow Gilad regular visits from the Red Cross and letters and food packages from home. In view of Benjamin Netanyahu's easing of the Gaza blockade with nothing in return from Hamas regarding the fate of Gilad Shalit, it is not surprising that his family are now accusing the Israeli government of effectively forsaking him. Yet Gilad is not forsaken: across the world, there have been gestures of support for him ranging from the conferral of honorary citizenship by Paris and other metropolises to rallies and marches. The Knesset has announced a new initiative to ensure that he is not forgotten, and the Jerusalem Post has opened a petition calling for his release. Irrespective of our own personal views on the Israel/Palestinian question, it would surely be a noble gesture if on Friday we all wore yellow ribbons to show that we are thinking of this young man, and to write to our lawmakers reminding them of his plight, as well as joining in any demonstrations that may be arranged in our areas to express solidarity with him and demand his immediate release and return to his country and his family. If the unthinkable has occurred, and Hamas has put Gilad to death, then by that action we shall know them. Israel needs a satellite English-language TV station - Now! 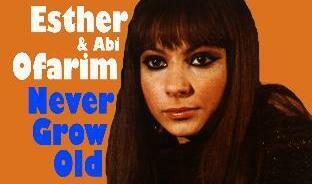 Can you remember the 1960s? I can! It was a time when the entire western public seemed to be in love with Israel. The state now so reviled was the miracle nation which, against all odds, had survived repeated onslaughts by surrounding countries bent on its destruction; it was the land of plucky pioneers who had made the desert bloom; it was the land of Jaffa oranges, of kibbutzim, of the venerable Ben-Gurion, of Yigael Yadin, Daliah Lavi, and Esther and Abi Ofarim. How my entire class of girls yearned to follow the example of our young non-Jewish teacher, who had spent her summer vacation picking fruit on a kibbutz! How vividly I recall the thousands of non-Jewish young men who on the outbreak of the June 1967 War volunteered - nay, clamoured - to fight for the little Jewish State; how vividly I recall the numerous non-Jewish men and women (many of them of very modest means) who - with touching spontaneity - sent unsolicited gifts of money to Israeli embassies and Jewish communal institutions for the war effort of a people that appeared to be on the brink of a second Holocaust. When, in just six days, the imperilled David achieved a stunning victory against Goliath, most of the western public appeared to rejoice. A one-eyed general captured the imagination; so did the now iconic press photo of Israeli troops at the Western Wall, awed and exhilarated at having liberated the Jewish holy site to which Jordan had forbidden access since 1949. Forty-three years later, although plenty of people can see through the false guise of Islamic fundamentalists posing as "peace activists", decades of subtle and not-so-subtle bias against Israel by left-liberal media outlets has worked its mischief. Not only do such outlets give scant coverage to the Israeli governmental viewpoint, in many instances they ignore it altogether. Inexplicably, Israel has been singularly maladroit in meeting this challenge. Once upon a time it had an effective and urbane spokesman in the late great Abba Eban, whose mother tongue was English. Then came an unfortunate period in which the voluble Hanan Ashwari made a personable communicator for the other side, while with the notable exception of Bibi Netanyahu a series of lacklustre spokesmen with a poor command of English were trotted out by Israel. It is, of course, in English, the lingua franca of our times, that the battle for hearts and minds is won or lost. And while Israel now has a cogent and unflappable media spokesman in Mark Regev, his advocacy is not enough. Fine representatives of Israel's cause such as he can only be as effective as the airtime they are allowed. Israel's pressing need is for its own English-language television channel broadcasting to the world, a channel countering lies, misconceptions and distortions by detailing Israel's history and showing the true image of Israel's vibrant democracy and culture in all its aspects - not least the medical breakthroughs and humanitarian initiatives of which few people outside Israel are aware because a media obsessed with portraying a mere sliver of a country facing existential threat as a ruthless and imperialistic military leviathan seldom if ever reports such developments. An English-language TV channel acting as the world's window on Israel would be expensive. But in a world which receives the bulk of its Israel-related news from the BBC, CNN, Al Jazeera and Press TV, failure to go ahead with such a project will prove costly in ways that no friend of Israel would wish to contemplate.